Not really silver! It is more like bronze. Unfortunately, despite the frame name, this is not really a silver frame. It falls into the bronze family- not what I was looking for. Terribly sorry to hear that this frame was not what you were hoping for. This is definitely an antique silver vs. a brighter silver. We are happy to offer you a return if you would care to exchange the frame for something else. We offer samples as well if you would like to see one before deciding. This frame is exactly what I need to finish my portrait ! As you know a frame is a part of a picture, a big part, so its important to find the right frame-with the colors reflecting the colors on the portrait. 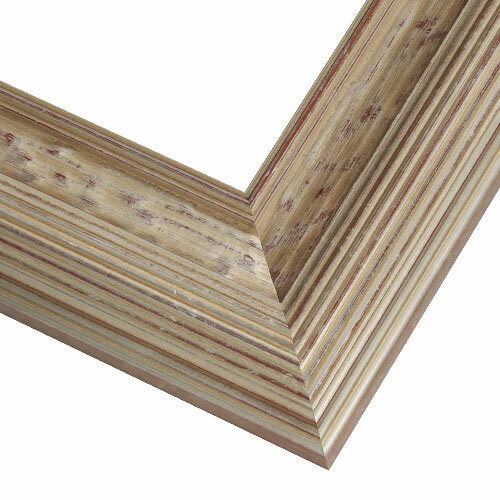 Can you do a custom color for one of your regular plain air wood frame styles? BEST ANSWER: Hello! Thank you for reaching out to us. At this time we are not creating custom colors for the frames. Our Custom frames can be cut to a custom size and shipped directly to you in little time. Please take a look at our Unfinished Woods Frames. This collection gives you lead way for unlimited staining possibilities. If you have any questions, please let us know. Happy Framing! BEST ANSWER: Yes. However, you may want to purchase a point driver, especially if you do a lot of framing, because the clips that are included to hold the work into the frame can be a bit unreliable. Thank you for your inquiry. Hardware is included with every order. Yes, the hardware is included. I have ordered ATS11 Frame, and was looking for a silver frame as the reference name is Silver Siren. However, the frame is pretty strikingly gold in color, not silver. I am a little disappointed, but don't wish it incur the expense of return shipment. The name of the frame is an anomaly. Any comments? BEST ANSWER: I am sorry to hear you were not satisfied with your frame. We would be happy to assist you with a return. We do carry this frame in gold. Just to confirm you didn't receive the https://www.pictureframes.com/Custom-Frames/Genuine-Wood-Antique-Style-Picture-Frames/ATS10-gold-wood-frame in error? Please let us know if you would like to return the frame or if we need to ship a different frame to you. I will have customer care reach out to you to see if you need any assistance. I am not sure what you're asking. The frame is decidedly gold toned, but does have some silver in it, too. It was perfect for the art piece that I framed because there is a lot of gray, beige, and tan in the print. Additonally, the inside border had a "bark" like quality to it and I framed a vintage bird print. I agree, it's pretty gold. It seems that a lot of what Pictureframes calls silver trend to gold colors.